Dramatic Breakthrough in Home Skin Care: Real Crystal and Vacuum Microdermabrasion in a Small, Counter-top System! You could easily pay over $200 for a single microdermabrasion treatment in a spa. Now, you can use similar technology for a fraction of the cost. In an age where it is hard to distinguish truth from hype, Crystalift is the FIRST and ONLY at home system that uses REAL vacuum and crystal technology renew and transform the appearance of your skin. Now, professional machine developers bring you the SAME technology in a small, easy-to-use, counter-top system for your HOME! Now, you can have professional-style microdermabrasion technology in a small, easy-to-use, counter-top system for your HOME! Say Goodbye to Creams, Scrubs and Vibrating Brushes. 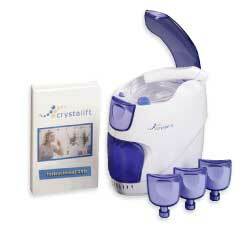 Crystalift gives you a Dual-Action process to fight the visible signs of aging. The unique process gently lifts away old, dead and damaged skin cells allowing newer, fresher skin cells to emerge - smoothing away fine lines and wrinkles, and reducing the appearance age spots and pore size. Say goodbye to out-dated skin care and experience Crystalift to give you softer, smoother, younger-looking skin in less than 10 minutes... GUARANTEED! SEE FINE LINES DISAPPEAR and more! Crystalift is great for ALL skin types. The breakthrough Triple-Action process uses a capsule filled with micronized mineral crystals and a resurfacing wand to gently reveal softer, smoother, younger-looking skin in less than 10 minutes. Each crystal capsule is individually sealed. Simply insert a new capsule when you're ready for a treatment. When the wand comes into contact with your skin, the crystal and vacuum-lift process is activated and the Dual-Action process begins. Step 3: Rinse and Glow! Rinse off remaining crystals and apply Crystalift Correctives. Your skin will look and feel smoother with a radiant, youthful glow! Now, enjoy the benefits of Crystalift at home for a fraction of the cost. Start experiencing softer, smoother, younger-looking skin in less than 10 minutes. ORDER NOW! CRYSTALIFT AWAY THE YEARS...in less than 10 Minutes!